Shiny Orimareena in game: 43 Who? Important notice! Pokemon Shiny Orimareena is a fictional character of humans. Tsareena (Japanese: ??—?? Amajo) is a Grass-type Pokémon introduced in Generation VII. It evolves from Steenee when leveled up while knowing Stomp. It is the final form of Bounsweet. 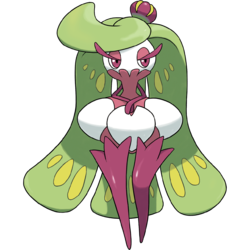 Tsareena is a bipedal, plant-like Pokémon with a humanoid appearance. Its torso, arms, and legs are dark purple, while its hips and head are white. On top of its head is a light green calyx. The shortest leaf of the calyx extends slightly forward and then curves to the right, similar to bangs. The other three leaves resemble long hair extending nearly to the ground and have many yellowish-green markings. On top of the calyx is a growth resembling a small, purple crown with four thin yellow stripes. It has heavy-lidded, dark purple eyes with purple eyelids and long eyelashes, but has no visible mouth or nose. The lower part of its face is hidden behind a short ruff extending up from its body. While its arms are slender with rounded, digit-less hands, it has long, powerful legs. The upper portions of its legs have three pointed projections just before the hips, creating the impression of long boots. The lower portion tapers to its small, pointed feet. It has wide hips made up of six segments. This Pokémon has a high-class nature, and punishes anyone that approaches it with evil in mind. This attitude will even be directed at its Trainer if given commands Tsareena dislikes, such as being told to use an ineffective move. In battle, it attacks using finely honed kicking skills and graceful movements. Additionally, its fragrance acts as distraction in battle. Touching the crown-like growth on its head is said to render it defenseless, however. Because only the most powerful Steenee evolve into Tsareena, this Pokémon uses its power to protect its pre-evolutions. Its long, striking legs aren't just for show but to be used to kick with skill. In victory, it shows off by kicking the defeated, laughing boisterously. A Pokémon known for the beauty of its well-shaped legs, it sometimes appears as a mascot in advertisements for beauty salons. Moves marked with a superscript game abbreviation can only be bred onto Tsareena in that game. Tsareena and its pre-evolutions share their category with Tropius. They are all known as the Fruit Pokémon. 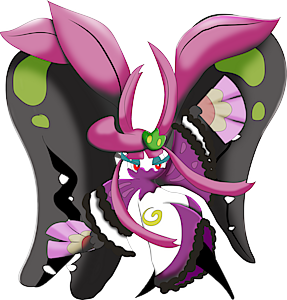 Tsareena appears to be based on a mangosteen and a female monarch, such as a queen. It may also be a reference to the mangosteen being known as the "Queen of Fruit". Tsareena may be a combination of tsarina, a Russian monarch, and serene. It may also incorporate mangosteen and queen. Amajo may be a combination of ?? amai (sweet) and ?? joo (queen).